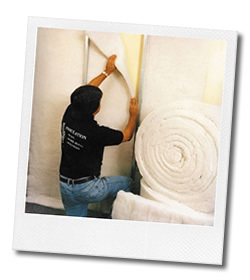 Whether your seeking thermal or acoustic internal insulation for your home or workplace, Enviro Queensland are able to deliver an effective solution based on all your insulation requirements. Our products are non-hazardous, environmentally conscious, and above all, effective. We utilise the trusted and and highly respected Higgins range of insulation that carries a lifetime guarantee (conditions apply) so you can rest assured with the knowledge that your insulation requirements are met based on the highest standards. We offer a range of high quality batts including wool-polyester in a wide variety of ratings and sizes to suit any job. For acoustic solutions, we can also meet your requirements with our products that can absorb up to 98% of sound. Why not talk to us about insulating your home or business and see how simple and effective it can be.